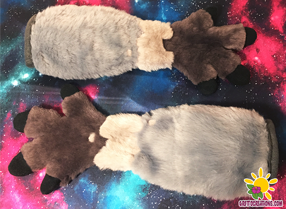 Foam bases, tails, and props are also available! The current queue and all progress can now be viewed in real time on Trello! If you have an account there, feel free to subscribe to project cards to keep track of the progress made. I will be doing my best to keep them as up to date as possible every day that I work! 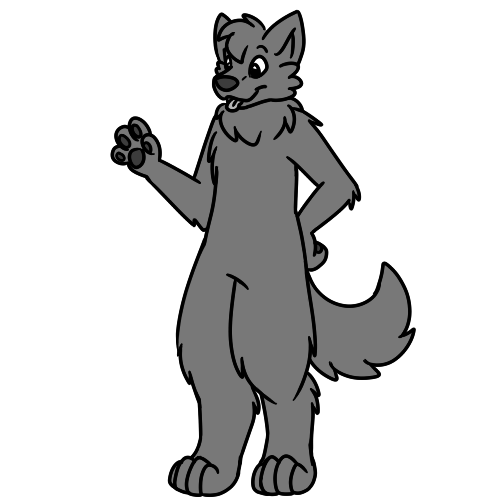 Mini Partials include a head, tail, and arms/hands. 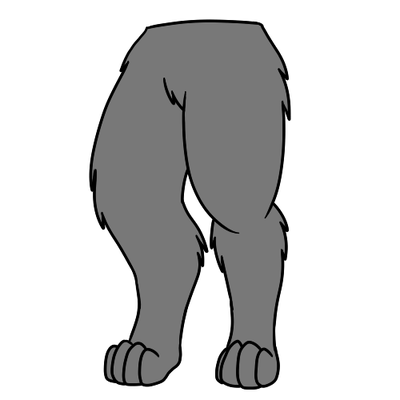 Full Partials include a head, tail, arms/hands, and legs/feet. ​Plastic claws and basic teeth are purchased from Dreamvision Creations. 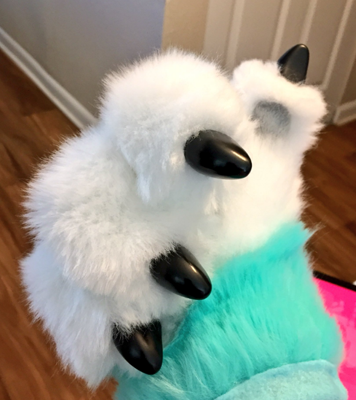 $15 is the price for a standard set of 8 'Nubbinz' styled claws. Different types are available as well, please let me know if you're interested in getting another style or size. Prices vary by style and size. There are also options for plastic horns, spikes, and other items that I may be able to use. Feel free to ask about your options! 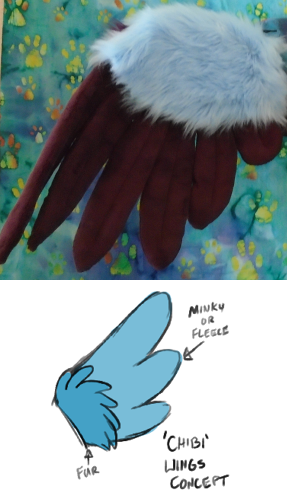 If you are perhaps interested in getting a 'head' start in making your own fursuits, I now offer foam base commissions for someone who would like to have a do-it-yourself project. These bases are made by hand, no molds, and are 100% unique! They are fairly quick to make, so turnaround time is usually within a month of ordering. Please be sure to read through my TOS before ordering. Payments will be required IN FULL at the time of ordering. If a cancellation must be made, 30% of the price cannot be refunded. Allergy Warnings: Heads are now lined with spandex/lycra interiors, which means the head will still be flexible while keeping the bare foam away from your skin. While the latex content is very low and likely not an irritant, it's important to know if you potentially have an allergy to the substance. If you have, or suspect you may have a latex allergy, please let me know so I can line the interior with an alternative fabric. (Usually simple cotton prints) All items come from a non-smoking, pet friendly home. I have a cat in my home, and while I do not allow him near my materials, dander and fur particles can still find their way into the fleece, foam, and faux fur. If you need to wear glasses while performing in suit, please let me know so I can build the head accordingly. Also, be aware that your glasses will most likely fog up, and can impair vision. I currently cannot offer follow-me eyes inside heads that need to accommodate for glasses due to the way they are constructed. 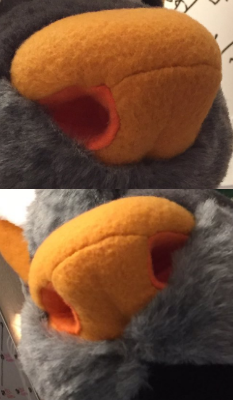 The interior of my suit heads are very breathable, but obviously limited compared to not wearing a head. If you have asthma or other breathing problems, a fursuit head may not be for you depending on your personal limitations. Please bear this in mind when considering an order. The best comparison is to put a medical face mask over your nose and mouth, and see how well you can perform while wearing it. 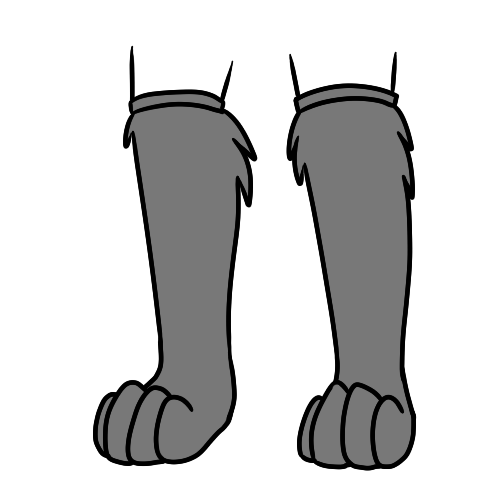 Paws of all kinds will limit your dexterity, so use caution when handling glass bottles or other fragile items while wearing paws. Do not drive while wearing paws, the fur and fleece will not provide a good enough grip, and could become a danger to you and others on the road. 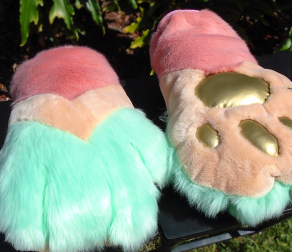 Plush styled paws will not allow for ANY dexterity due to their construction. Keep this in mind if you're considering ordering this style. 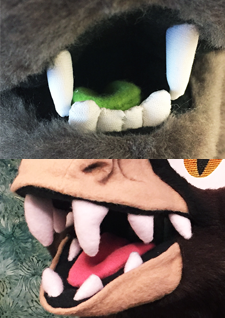 If you are ordering a suit with an interchangeable tongue, or any other part that requires magnets, please read this section! The magnets I use are called neodymium, or 'rare earth' magnets. These are very strong, and have been known to cause damage to some electronic devices. Please refrain from using cell phones, tablets, or other electronics close to the magnets on your fursuit head. They can also pinch the skin if not handled correctly, please feel free to ask if you have any questions about the magnets. If you are interested in commissioning a custom tailored fursuit, please have ready a reference image showing at least a front and back view of your character. (and side view or closeup images if necessary) If you do not have a reference sheet, you can contact grotto.fursuit@gmail.com to either commission a sheet, or I can find an artist to create one for you. 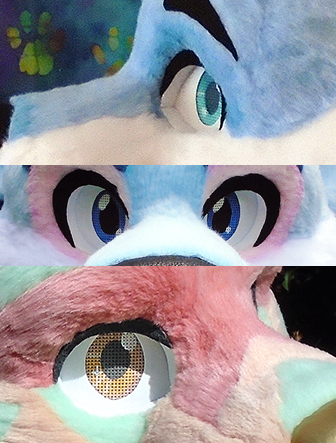 Please take note that the more colors your character has, the more the price will most likely go up because I will need to order more kinds of fur. 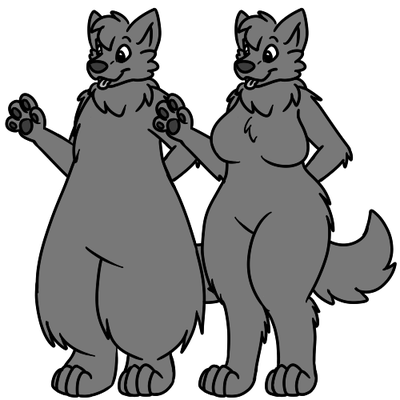 I do have a stock of fur styles and colors, and you can get a price drop if your character contains them. 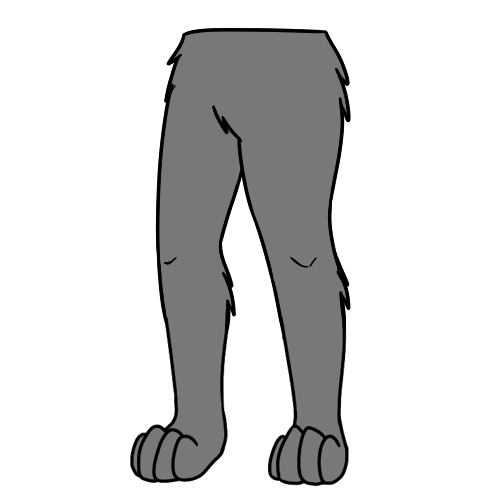 This will be addressed if you are chosen for a suit during a commission opening. 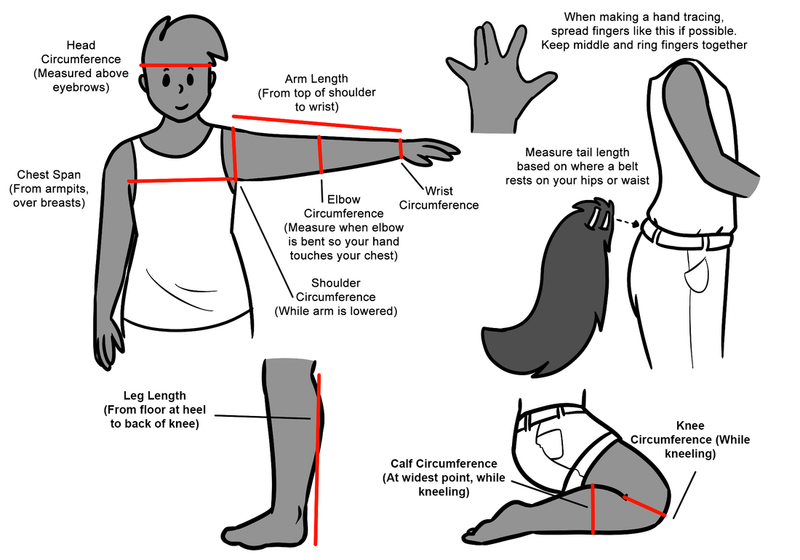 Below is a helpful chart to show measurements required for my suits. Before sending your duct tape dummy to me, I have a few rules I'd like to point out. Failure to follow these rules can result in your DTD being thrown out, and you will be required to make another. Poor construction often leads to longer production time, which will also cost more money in the long run. Please review this section to avoid extra costs and time spent!